You are currently browsing the BestOfBothWorldsAZ.com blog archives for August, 2014. Summer time heat and sun can contribute to common skin concerns such as skin discolorations, sun damage, free radical damage, heat induced inflammation, acne, premature aging and skin cancer. With the appropriate skin care products you can prevent some of this damage while still enjoying a little fun in the sun. I have always referred to “summer as acne season”. It is hot and everyone is sweating, this can contribute to an increase in clogged pores and breakouts. First of all, you need an actual facial cleanser. Facial wipes, makeup remover and shower gel, do not count as a facial cleanser. In the summer I recommend a foaming cleanser, if you have dry skin use a gentle foaming cleanser. It is also good to incorporate an exfoliating cleanser with active ingredients such as glycolic or salicylic acid with exfoliating granules that are not too abrasive. I usually recommend using an active cleanser at night and your basic foaming cleanser in the morning. Some active cleansers are stronger than others, so be sure to consult with your Esthetician for recommendations on which product is best for you and how often you should use it. Exfoliating Cleansers We Like : AHA/BHA Exfoliating Cleanser or GlyPro Exfoliating Cleanser by Skin Medica, Offects Exfoliating Cleanser by ZO, BioGlycolic Rusurfacing Body Scrub by Jan Marini. Sun exposure and pollution cause oxidative stress on skin. Oxidative stress can directly damage cell membranes, proteins, DNA as well as turning on the cellular and molecular mechanisms that accelerate aging. This means a break down of collagen, less collagen production and increased inflammation. Use topical antioxidants during the day to help combat the many free radicles we encounter during the day and reduce inflammation in the skin, which can result from heat and sun exposure . Some antioxidants such as vitamin-C, have photo-protectants abilities and are believed to enhance the effectiveness of sunscreen. A photoprotectant works by neutralizing the UV rays, rather than reflecting or absorbing UV rays like a sunscreen, so use them together to maximize your protection. Pro-Niacin delivers niacin to the skin cells and enables healing from within, helping the skin repair and protect itself from sun damage. Nia24 has a line of products that contain Pro-Niacin, including the neck and décolletage. The Nia24 Skin Strengthening Complex is a light weight daily moisturizer that contains 5% Pro-Niacin, Vitamin-A, antioxidants, ceramics and peptides. It seems pretty obvious to use a sunscreen, but choosing the best sunscreen can be confusing. You should select a product that is an SPF-30 or above, but more importantly it should be broad spectrum. Broad spectrum means it will protect skin from both UVA and UVB rays. There is currently no rating that measures UVA protection. I recommend looking for a sunscreen that contains Zinc Oxide as it is the most broad band protectant and also works to block some of the heat that can contribute to inflammation, rosacea flareups and broken capillaries. Do not forget to protect the delicate skin around the eyes, which is highly susceptible to skin cancer. Skin Cancers on the eyelid can be difficult to detect and challenging to treat. If you find that your eyes sting or burn with your usual sunscreen, try Skin Ceuticals Physical Eye UV Defense, it is formulated for the area around the eye and will not migrate or run into your eyes. 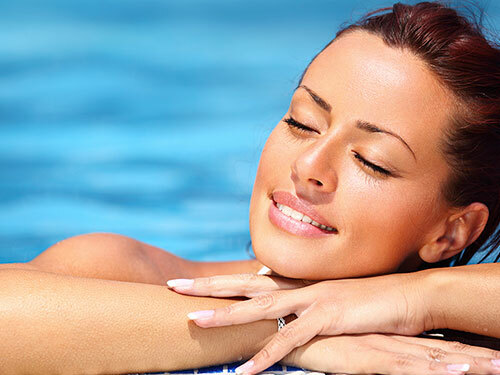 In addition to protecting the skin from the damaging effects of the sun it is also slightly moisturizing and tinted. I use this on my kids and it is easy to put on them without a fight.